IBM released the latest version of Cognos Analytics (Cognos 11.0.5) on November 25, 2016. This newest version includes even more exciting enhancements extending the broad capabilities of the product. It’s available for download and remember there is a new upgrade process for Cognos Analytics which is different from previous versions. You no longer have to go through a migration/upgrade path, it’s as easy as installing it over what you already have to quickly access all the new features and enhancements. In late summer IBM announced they had established a partnership with Mapbox and Pitney Bowes to enable them to deliver a high standard of mapping visualizations and interactivity. In this new release they are finally here and able to use in Dashboard. You have a couple of options when adding a new Map, drag in the new Map widget or drag your country and state on the canvas. We are very excited to have direct access to existing relational framework manager packages in Dashboard. It’s as easy as selecting an existing framework package, no need to build a data set if you don’t want to. Only DQM packages and/or JDBC datasource connections are supported with this new Dashboard capability. If you have CQM packages you will need to set up a JDBC connection in order to use the datasource in Dashboard. Great news, you no longer have to download and upload visualizations starting this release. IBM has included the newest visualizations out-of-the-box and will maintain and enhance them in every release going forward. This includes but not limited to adding more properties and more visualization types. With all these great new enhancements and more now is the time to take the leap. Call us at 1-800-QUEBIT1 we are ready and able to help guide you through the upgrade process. We have the expertise to do it for you or to help guide you through the whole process if you want to tackle this yourself. 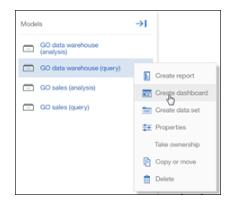 Want to know more about all the new features of Cognos Analytics 11.0.5? Register Now for our upcoming Webinar: Cognos Analytics 11.0.5 Released: It’s a Brave New World Out There!